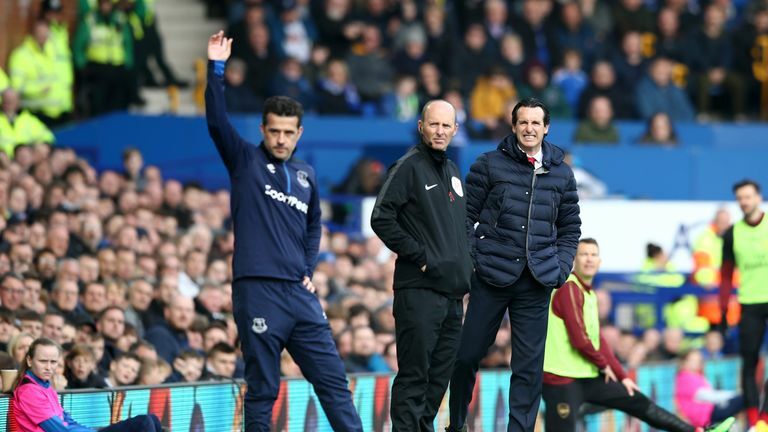 Emery: "After the result, we can be negative because three points less but it is in our hands, continue to take chances and the opportunity to be in the top four"
Unai Emery insists Arsenal need "balance in both halves" after losing 1-0 to Everton, although he remains positive about their league position, saying they still have a top-four finish in their hands. 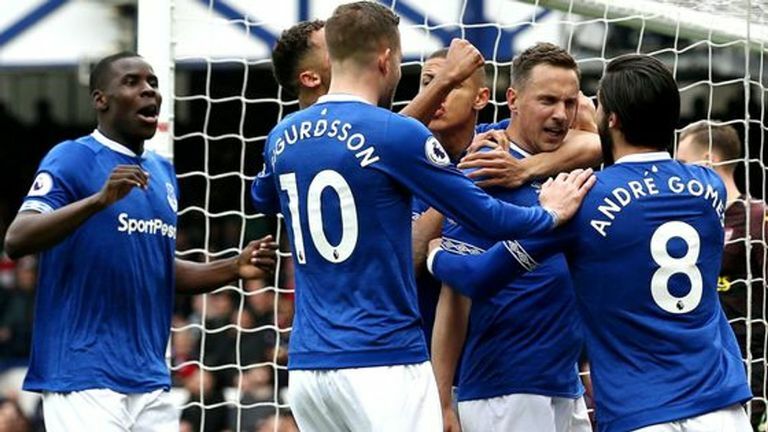 Phil Jagielka's 10th-minute goal was enough to deal a blow to Arsenal's hopes for a top-four finish with Everton now winning their last three Premier League games. Arsenal's away form to cost them? Emery picked out good and bad points from each half but says his side need to start being more consistent if they are to truly target a top-four finish. He said: "Today, there were two different halves. In the first half, we were consistent, we didn't concede good chances for them but they scored from one throw in, unfortunately for us, and in the attacking third, we needed more. "But if the result was like we deserved in the first half - equal - we can continue like that in the second half and use the moment to take a better result and better chances in the attacking third. "But with the half-time result, we needed to change quickly and in the second half, we decided to change the system and defensively, we lost consistency. They created more chances and we created better chances than the first and we didn't score. We need this balance in both halves. We lost a great opportunity today to take three points. "I am, in my mind, with the same idea before the match. Today was a very great opportunity to take the three points and continue to third in the table but after the result, we are fourth. "We need, over 38 matches, to be consistent and today we lost this, but are going to have chances in the next matches. It depends on us and others teams but after the result, we can be negative because three points less but it is in our hands, continue to take chances and the opportunity to be in the top four." Although Arsenal missed the chance to leapfrog their local rivals Tottenham into third place, Emery remained positive about their season overall. He added: "Generally, we are well. You cannot think today that we lost and we are very bad. It is a bad result and I don't think it was a good performance today but I think we are still fourth and our great opportunity today was to leave here being in the third position. "We lost one opportunity and today, we didn't show our best performance, our capacity to impose our game plan against them but we are going to think over the next matches. "Generally, we are being consistent and we can continue to be consistent if we can win and be together, feeling together with good spirit and some frustration can come to us but not change our way." Jamie Redknapp, meanwhile, defended Emery and insisted Arsenal's squad still lacks the extra quality needed to change games from the bench. "I think there's been so much progression so I am actually loathe to be critical," he said. "I think he's done so well. They do look a different side. As much as I think you've got to have a bit more intensity when you play away from home, I think it needs a bit more quality as well. "That's what he needs to bring in next season because he hasn't got those kind of players he can bring in to change it." On their remaining fixtures this season, he added: "They're not easy games. You look at the home games, I think they will take care of themselves, but they have got to find a way of getting two or three away wins. It's given United and Chelsea hope, that result today. It's opened it right up again." 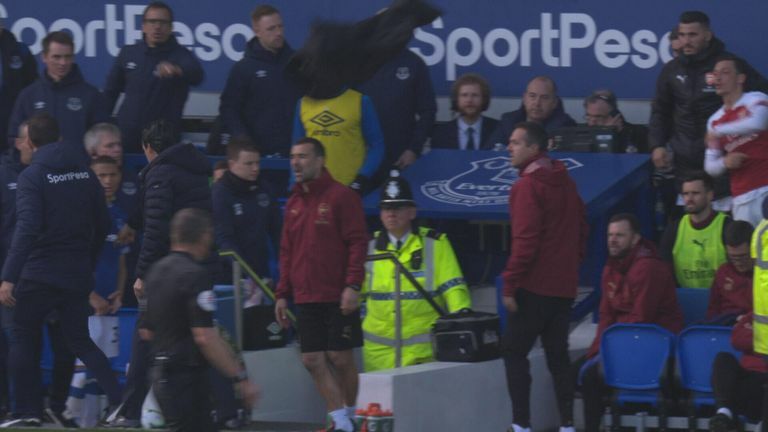 Everton boss Marco Silva was involved in a heated touchline discussion with opposite number Unai Emery after a dangerous tackle by Shkodran Mustafi on Dominic Calvert-Lewin. Arsenal away form to cost them? And as staff from both benches clashed, Ozil threw his coat into the mix, appearing displeased as he returned to his place on the Arsenal bench.